Robust beneficiary outreach and education are a core part of the design and implementation of the Coordinated Care Initiative (CCI) and Cal MediConnect. The Department of Health Care Services (DHCS) developed the Cal MediConnect Beneficiary Toolkit to support beneficiaries as well as be a resource for health plans, advocates, and community organizations (including Health Insurance Counseling and Advocacy Programs [HICAPs] and the Ombudsman) that engage directly with beneficiaries. 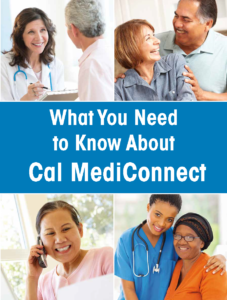 This reader-friendly toolkit provides useful information for dual-eligible beneficiaries examining their health care options, such as: how care coordination can improve health outcomes, additional benefits provided by Cal MediConnect health plans and how to keep your current health care providers. Beneficiaries and their caregivers should use this toolkit along with information provided in formal notices and guidebooks.